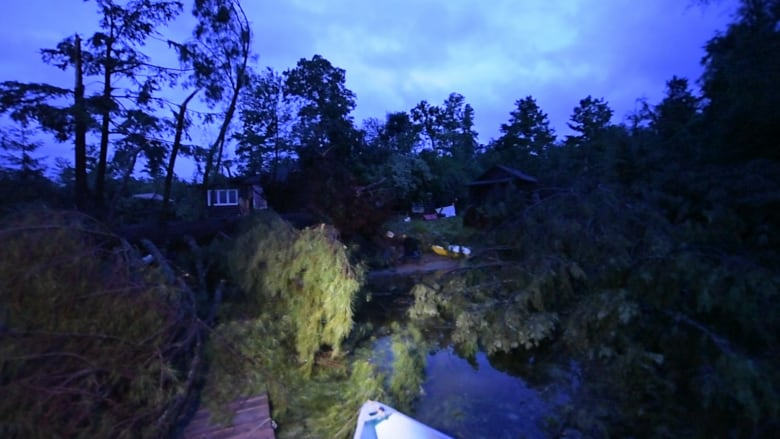 Environment Canada has confirmed that a tornado touched down in Ontario's Muskoka region during a bout of intense thunderstorms that pummelled the area Friday evening, leaving some 3,000 customers still without power. 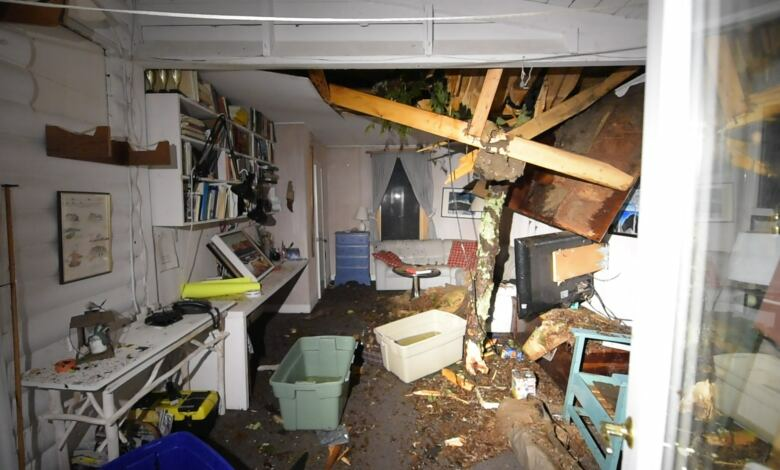 Environment Canada has confirmed that a tornado touched down in Ontario's Muskoka region during a bout of intense thunderstorms that pummeled the area Friday evening, leaving thousands of customers still without power. 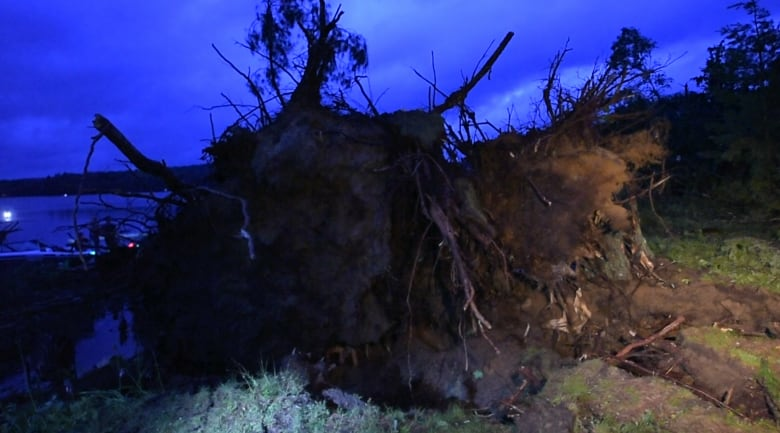 The weather agency sent an expert to Huntsville on Saturday after eyewitness reports of a twister and images of damage to trees and buildings. It's too early to know how strong the tornado was, but it damaged several structures. The storms knocked out power to roughly 13,000 Hydro One customers in the area Friday night, and as of Saturday evening, about 3,000 remained without power in the area about 200 kilometres north of Toronto. Storms also hit the city of Brockville, where there were 160 customers without power. Dana Gardner, spokesperson for Hydro One, said its crews are expected to restore power to a majority of customers in cottage country by 4 p.m. on Sunday but customers should check the Hydro One map online for the most accurate restoration times. "Our crews are making progress," Gardner said Saturday. "Our crews are working to restore power as quickly and as safely as possible." The storms downed trees, ripped shingles off roofs and damaged docks. High winds snapped trees in half and some landed on cottages. Some roads were blocked on Friday night. Arnold Ashton, severe weather meteorologist with Environment Canada in Toronto, said Huntsville was one of the hardest hit areas. "It was quite an intense system that moved across southern Ontario, and there were a number of strong thunderstorms. There were some isolated severe thunderstorms. One in particular moved across the Huntsville area yesterday afternoon and caused sporadic damage through several areas," he said. The federal agency has watched a video of what looks like a water spout moving across Fairy Lake east of Huntsville. "That's part of the puzzle," he said. "It has yet to be determined whether that was involved in the damage that occurred in the area." A water spout is a column of rotating wind that is tornadic in nature, he said. "It's basically a core of rapidly rotating air as it is moving across a body of water," he said. Between 70 and 80 millimetres of rain fell in the Huntsville and Lake of Bays area during the thunderstorms, the federal agency said. There was also possibly hail, he said. A tornado warning for the area was issued on Friday, then lifted.